Korea's top economic and monetary policymakers are scheduled to meet early this week to discuss an array of economic issues such as the growing trade tussle between the United States and China and sluggish job creation, government officials said Sunday. 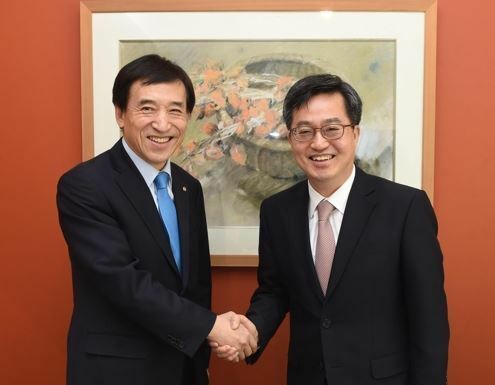 Finance Minister Kim Dong-yeon and Bank of Korea Gov. Lee Ju-yeol will meet Monday for their seventh round of policy talks since Kim took office in June of last year. Other senior officials from the finance ministry and the central bank will also attend the meeting, they said. For 2019, the BOK also cut its growth estimate by 0.1 percentage point to 2.8 percent from its previous forecast. Asia's fourth-largest economy is facing a series of headwinds such as a slowdown in facility investment and private spending, with exports, a major growth engine, feared to experience fallout from the escalating trade war between the world's top two economies.